HEALTHY BREATHING: Svanhild Danielsen (58) from Tonnes in Lurøy municipality was bothered by strong asthma and allergies for almost 30 years. Daily she had to take medications. 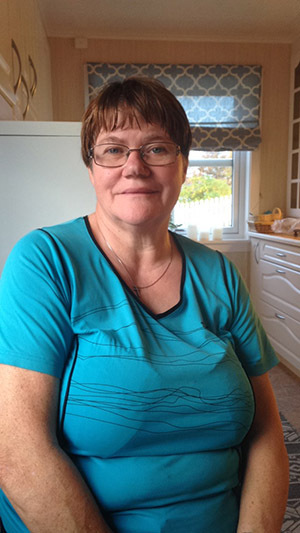 At a meeting in Stjørdal in 2014, she was instantly healed. For nearly 30 years Svanhild Danielsen (58) from Tonnes had severe asthma and allergies. This created major difficulties, because the family were farmers. Every day she had to take large doses of medication. After receiving prayer in Stjørdal in 2014 she has never taken medicines. On the edge of the peninsula between Melfjord and Kvaløyfjord, lies the small community of Tonnes in Lurøy municipality. Among the on-site 94 inhabitants (2016) Svanhild Danielsen and family live. There she has lived for 39 years where she has been farming. Throughout the years, it was very demanding, because she was bothered by asthma and allergies. When I was 26 I had my first attack. I was standing there piling hay when my chest suddenly tightened immensely. I had to stop, because I could hardly breathe, and I stood there gasping for air. It was very uncomfortable, she says. Similar events were repeated constantly over the coming years, but Svanhild did not go to the doctor. During this time she also developed numerous allergies. -We had a lot of grass on the farm. Both sowing and stacking hay were tough times. I coughed so I almost choked. My nose and eyes were watering. Eventually I had to stay indoors when it was at its worst. Every once in a while I had to go to sleep with the doors and windows closed, because I was so ill. In 1991 one of Svanhild's sons was born. He struggled terribly with the respiratory system, and doctors eventually found out that he had asthma. The doctor wondered if this was hereditary and therefore sent Svanhild to a specialist at Sandnessjøen hospital. -You have asthma, the doctor said, already before Svanhild had managed to take any tests. The doctor could hear from the sound of Svanhilds breathing what she suffered from. The tests also showed aggressive asthma. From that day she had to use loads of medication. -I used two types of asthma spray, several allergy pills, nasal spray and a nebulizer. Often I had to use them several times a day. When I received the medication, life became easier, but I had to have medication close by in case I got attacks. I was often in the mountains herding sheep. There was a lot of running, and I kept needing to stop to use the asthma inhaler, allowing the lungs to open up. In addition I had perfume allergy. I therefore had to keep my distance from people with heavy perfume, as well as perfumeries. On Sunday February 2, 2014 Svein-Magne Pedersen was preaching at the mission Covenant Church in Strjørdal. About 300 people had showed up and 30 people had accepted Jesus. During the sermon Svanhild got very warm. Twice she had to exit the premises to cool down. -Eventually Pedersen started praying for those requesting prayer. When he started praying for me, I felt a blazing heat that flowed through me. When I went to bed later at night, I decided not to take asthma medicine because I wanted to observe the lungs. In the days after I felt nothing of the asthma or allergy. It was amazing! On February 12, 2014 Svanhild went to the doctor to have her lungs checked. There she had the happy news confirmed. The doctor could not find neither asthma nor allergies. - You need not come back any more, the doctor said. -It was amazing what had happened! Now it has been three years and I have not taken a single asthma or allergy medicine. My lungs are totally fine. Now I often work with flowers without the body reacting and I can enter perfumeries without problems. I ride my bike, run and stroll in the woods. Now I can also run after the sheep without the need for medication. There is power in prayer, says Svanhild.